Plug & play ARM environment with FPGA fully configurable! 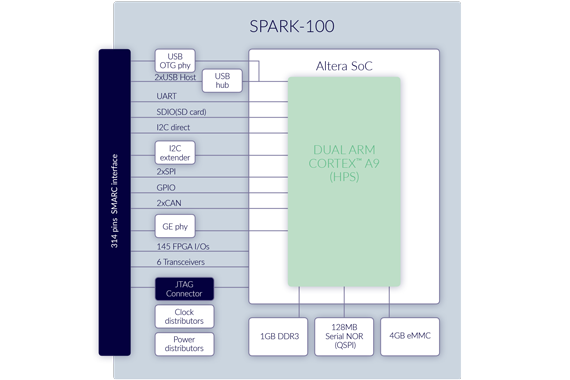 The Spark-100 is a ready to use industrial embedded System-On-Module (SoM) based on Altera Cyclone® V SOC. Using the FPGA’s configurable logic, the Spark enables unlimited possibilities to add customized accelerators and virtually any peripheral set, giving the developer the power and flexibility to design the optimal solution for his application. Spark-100 uses a standard SMARC® interface, which is supported by key industry vendors, ensuring adherence to strict technical specifications and offering compatibility with other vendor’s platforms. QSPI NOR memory offering up to 32MB for small footprint Linux solution. 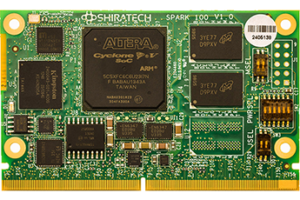 Shiratech provides a full version for SD/eMMC and a small footprint Linux for QSPI flash only. The CB-52 is a full-featured development board for the Shiratech Spark-102, with an emphasis on Industrial Ethernet and networking applications. It provides extensive connectivity to both HPS and FPGA, with built in networking and connectivity interfaces along with an HSMC slot for expansion modules and capacitive touch screen. One 1000/100 Ethernet and two 10/100 Ethernet interfaces. USB to RS-232 convertor for UART over USB emulation (DBUG). LCD & Audio connector – Four pairs LVDS interface (24 Bits), I2S audio interface. Camera connector – Two lanes CSI interface. HSMC connector – Supporting Altera compatible modules. Spark-100 uses a standard SMARC® interface, which is supported by key industry vendors, ensuring adherence to strict technical specifications and offering compatibility with other vendor’s platforms. All ARM and FPGA signals are routed to the SMARC® interface as per standard definitions, yet FPGA interfaces can be freely configured according to user application.